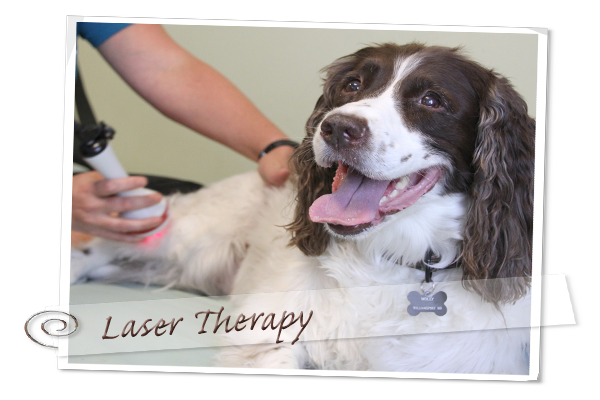 Laser Therapy involves passing a specific wavelength of light across your pet’s skin, directly above the area where your pet has discomfort or pain. Your pet will feel only a soothing warmth dispensed to the exact spot where the tissues need help. The laser energy positively stimulates the functions of injured cells and energizes the cells to promote healing of damaged tissue. It works on any pain from ear infections, hot spots and surgery sites to chronic arthritis and overworked muscles. Energy is put into the cells causing them to metabolize faster. This helps the area heal more quickly. The laser treatment significantly reduces the pain at the site with the release of endorphins. The Laser also dilates the vessels at the site, increasing blood flow to the area which reduces swelling and promote faster healing. There is no anesthesia required as your pet feels only a little bit of warmth in their tissue. The beam of Laser light is continuously passed over the affected area for usually 3 to 8 minutes per site (the length of time depends on the size of the pet and the size of the treatment area). During this time your pet feels extremely comfortable. We encourage owners to stay in the room with their pet while the laser treatment is done. Most chronic conditions require at least 4 or 5 treatments in order to see noticeable improvement in mobility and pain reduction. In cases of more acute pain some pets will respond positively with just one treatment that should be performed as soon as possible after the injury or disease starts. Treatments are cumulative in nature; especially with chronic conditions. It may be necessary for your pet to get regular treatments, or booster treatments, to maintain the positive effects long term.